I’ve been meaning to write this post since last week (whoops) but what can I say, I’ve been swatching away and following up on all of my post-show priorities. For those of you that don’t know, TNNA is The National NeedleArts Association trade show, is only open to industry professionals, and is not a cash and carry show. It’s basically a market where yarn companies and yarn shop owners meet. Designers and authors come to see what’s new, make introductions to different companies and also, pitch patterns to companies/magaznes/etc. I went with no real agenda except to promote my book, Crochet Adorned (since I missed TNNA last year), actually meet a lot of people I have been working with over the years, catch up with old friends, seek new opportunities, and help pick yarns for Yarnivore, my local shop (the owner is very nice and entertains all of my desires, thanks Tammy!*). *If I keep saying that, she has to keep it up. There were so many goodies to look at, and I was fortunate to bring some of them home with me. I’m always excited to find new yarns and get the chance to crochet with them, so I was excited to add these to my collection. 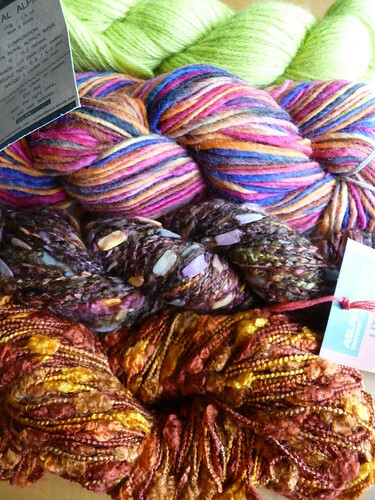 First are some truly lovely fibers from Anzula. I am in love with these and have been petting them for the past week, I’m not sure they need to be made into anything because they are a great stress reliever as is. All I have to do is touch them! The berry colored yarn (colorway: Boysenberry) is called Cricket, it’s an 80% Superwash Merino, 10% Cashmere and 10% Nylon blend, it’s nice and squishy and the hand-dyed colors are amazing. The bluish yarn (colorway: Emerald) is called Oasis, and it’s a heavenly 70% silk, 30% Camel blend. This yarn is available in local yarn stores and on Anzula’s website. I also picked a little bit of everything over at the Asland Trends booth. I saw that novelty yarns were coming back a bit at this show and I’ve been curious to try crocheting with them. The truth is, sometimes crocheting with novelties can be a bit of a beast–that’s why I’m glad I can also knit (just in case!). Shown above (top to bottom) are Royal Alpaca, Bariloche, Litoral (this will be coming to Yarnivore soon!) and Tango. 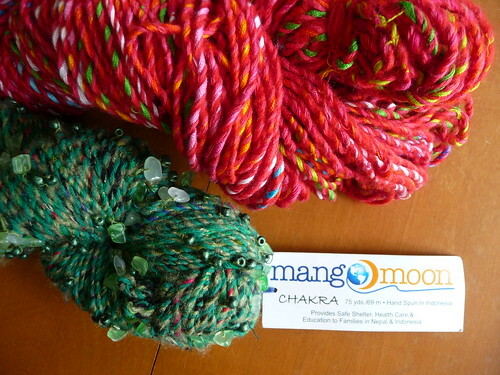 Part of my relaxed mission included researching green and organic yarns, and so I was happy to stumble on Mango Moon. While they don’t offer organic yarn, many of Mango Moon’s yarns contain recycled materials, and proceeds from their purchase help support the Nepali Women Empowerment group. I was most excited about Mantra and Chakra. Both are made with 30 % recycled viscose, then plyed with cotton and nylon so that they’re actually enjoyable to work with. I’m currently swatching with these, and they’re also already at Yarnivore. That was quick! Now let’s look at these two beauties. They were handed to me by Louisa Harding herself, who suggested I try crocheting with them after she flipped through my book. It was lovely to meet her and of course I thought it was pretty awesome of her to recommend which of her yarns worked well for crochet. The Grace (green above) is a silk/wool blend that now comes in hand-dyed colorways which I was also really attracted to (& the Knitting Fever folks were nice enough to let me take that, too). 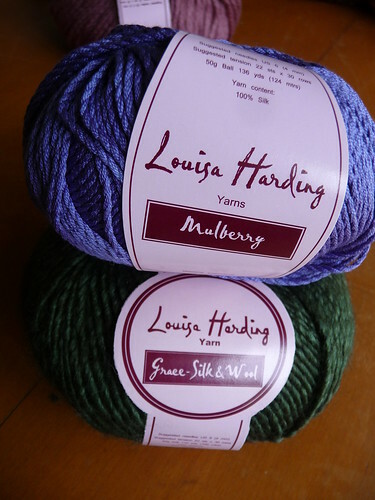 The Mulberry is also great to work with, plus it hovers between sport and DK weight (more of a sport weight, in my opinion)–personally, I think there’s a bit of a gap in the market as far as high end sport weight yarns go, so I was happy to find this. Crochet looks so lovely in thinner weight yarns, note to yarn industry: sport weight is not just for babies anymore! The mulberry is 100% silk, but looks like it will wear really well due to the nice twist. 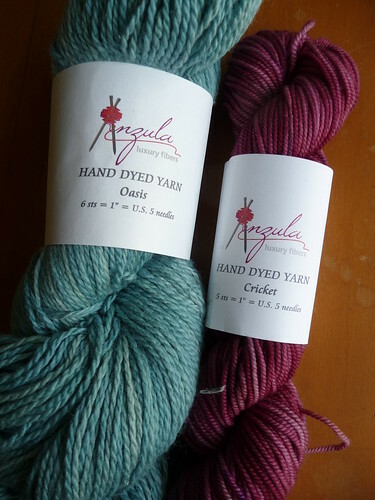 I’ve been swatching with both of these yarns this week, fingers crossed that the projects get accepted. Notions companies also exhibit, and I was happy to meet up with Michele, a friend of mine from the Adorn days at the Simplicity/Boye booth. 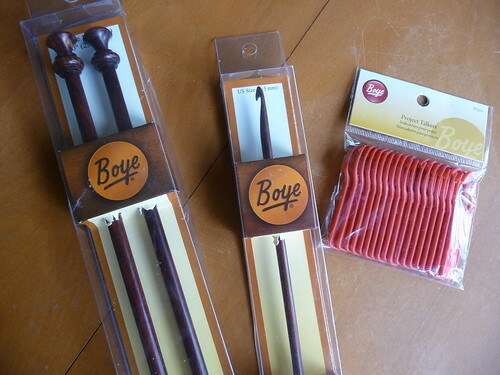 She hooked me up (ha, ha ha, yes I went there) with their new Rosewood collection of hooks and needles. Honestly, I hadn’t been a big fan of wooden hooks before because the ones I’d tried dragged (ie. did not allow my yarn to fly off effortlessly). But, I am happy to report that I played with these at the hotel and they are nice and smooth around the throat. Plus, I think I’ve become a much more proficient crocheter, so the things that bothered me as a beginner (when I bought most of my hooks) are no longer an issue. I want to try these with tunisian crochet: because the shaft is a uniform size (no thumb grip) I’ll be able to put all of the stitches for smaller projects on these, no problem. I love the knitting needles too, they are wonderfully lightweight for their size. Boye is also introducing a bunch of great new notions, along with a line of fun stuff from Drew Emborsky, The Crochet Dude (who I also got to meet), so I got to see all that, too. I’m trying to put together a little giveaway with some of their new stuff for next month, so stay tuned! And that’s my swag roundup. There was lots of other cool stuff, but I couldn’t list it all. And just to be clear, no one paid me to write this post. I did, of course, get the free stuff, and since I like it, I wanted to share my thoughts! Thanks to everyone who gave me samples to play with. I felt a lot of positivity from most companies about crochet (despite my last post), and that was g-r-e-a-t! Hey nice shout out on GoCrochet! I'm so excited to follow both of your blogs!I'll be looking for your book on my next trip to Barnes and Noble. congrautlations on your success! Really yummy yarns! I am also lucky that my favorite LYS often order yarns that I am dying to get my hands on. They never used to keep felting yarn and my nagging paid off. Now they keep several brands and last week I saw they now also stock Patons and even Lion Brand yarns. Really affordable yarns and great value for money. we just had a conversation yesterday about blogging ethics, I like the disclosure. can't wait to see what you come up with.